Ryvita is a rye-based crispbread which until 2009 was manufactured by The Ryvita Company. The company was founded in Birmingham, England, in 1930 and is today a subsidiary of Associated British Foods. Ryvita crackers are popular with dieters. 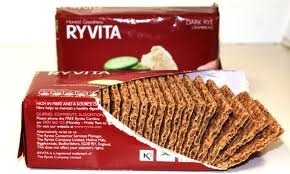 Ryvita are holders of a royal warrant granted by Queen Elizabeth II as 'Manufacturers of Crispbreads'.